About 4 minutes and 50 seconds reading time for this 1.1K word page. "It's the 500 year event." "It's the 1,000 year event." A. Builders building new homes and do not follow Elevation requirements set by HUD are not informed. B. Builders building Slab on Grade in a Special Flood Hazard Area (SFHA) are not informed. C. Communities allowing building below Base Flood Elevation (BFE) +2 are putting people and structures at risk and are not informed. D. Building in a flood zone X (0.02%) on grade is not a very good calculated risk. E. Displacing dirt by digging a hole where the water table is at the same or higher level of elevated fill dirt is not informed engineering. All the points above seemed to be proven during the Louisiana Floods of 2016 and the Texas Floods of 2017. Our home had it's first elevation survey in 1981. The surveyor claimed the foundation slab was 42.7 feet and the B.F.E. was 42.7 feet in 1981. In 1983 11 inches of rain fell in a day over Denham Springs. The Flood waters reached 300 feet away but did not touch the property. August 13, 2016 the Amite River reached 46.2ft early that morning. We had 52 inches of water from ground level. We are one of the few (450) Substantially Damaged homes and are required to Elevate our Slab on Grade 2800sqft home. To reach BFE we would need to elevate at least 37.5 inches. The River left a mud line of 48 inches inside the home and 52 inches in parts measured from ground level. 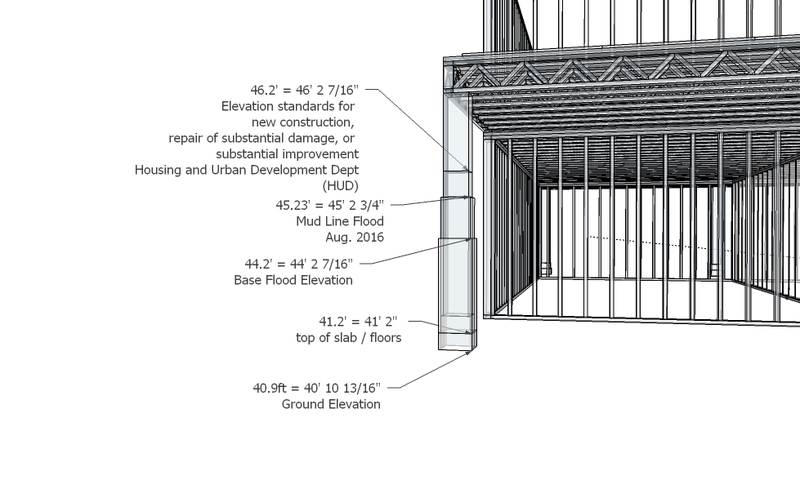 Our Building Code calls for B.F.E. and is expecting us to bring our floor up to that level. But logic would be to build higher than B.F.E. due to the fact that our August Flood of 2016 hit well above our B.F.E. 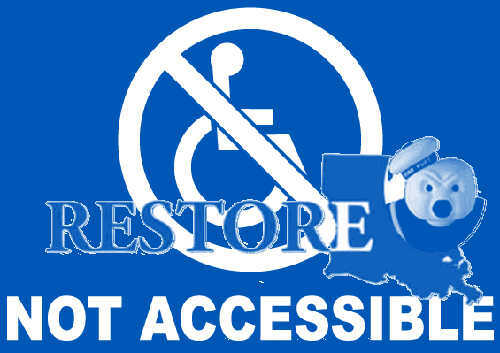 Community Block Grant Program - Disaster Recovery (CBGP-DR) which is what Restore.LA.Gov is using and they are actually publishing some of the rules regarding elevating with the CBGP-DR Funds. The first and most important item to remember is if you are applying for the CBGP-DR for elevation you should (must) follow the HUD guidelines and not your local City Planners Guides unless they EXCEED the required elevation standards set by HUD for the CBGP-DR. The data to elevate +2 feet above B.F.E. was provided by HUD / CBGP-DR to qualify for any Grant to elevate by reconstruction of a substantially damaged home. HUD weighs in regarding new construction and substantially damaged homes being rebuilt. I also read that FHA loans will not be issued to new homes built in SFHA or to homes below HUD elevation standards. When FIRM data is NOT available or the area is a 0.02% (500 year flood) they show +3 feet AGL or FIRM Map Data elevation. This would match the building codes of neigbhoring cities for properties near known flood zones. So how high do you elevate? We used a Topographical Map, checked elevations, mapped river stages reported during the flood and filled in every spot on the map that was 40ft or less. Then we mapped the water runoff paths and major streets that allowed water to flow. Using this data we mapped the major flood paths (water flow) and the displacement zones then added one foot for every foot of river stage increase. 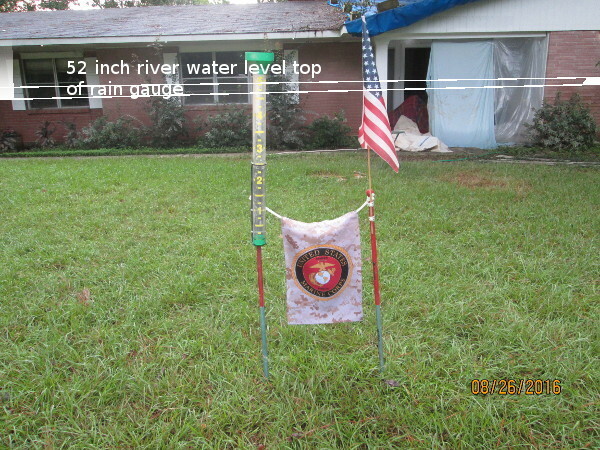 In the end, our subdivision had 1.5 feet less than that of the highest river stage. The only other differences would have been each properties lot elevation above sea level and home elevation above ground level. Our house sits at 40.7 feet. August 2016 River Stage was 46.2ft. August 13-15 2016 our property had 5ft of water above ground level. Today we are following the guidelines set in the Nov. 21, 2016 CBGP-DR publication available at the Federal Register. 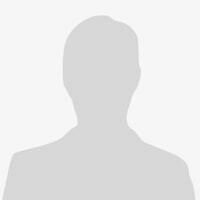 By following these guidelines you will be eligible for CBGP-DR according to this publication. (See Reference 1). The major difference is elevation. HUD CBGP-DR requires 2ft above certified B.F.E. to qualify for elevation reimbursements. Now it's my turn to ask you. How high are you elevating to after the 2016 floods? Add 2.5ft and you are at our ceilings height, maybe even yours. The question then was, "Do we build on top of our walls a second story?" If you add 1ft max margin of error you're only 1.5ft from the ceiling height. It's really not much so you check your wall structure, take out windows, add reinforcing supports and build your elevated platform starting at 8ft off the ground. Now you know you have parking under your home. You also know you qualify for HUD CDBG-DR funds because you followed the Federal Rules.